If you are ready to start thinking about how you can rapidly change in the way you do your business we can offer you a complete set of services to help you change the way you do business with assistance of best in class solutions. More and more enterprises are running their SAP applications in the public cloud (AWS, Azure or Google) to reap the benefits of infrastructure and licensing flexibility, security and reliability, easier integration and advanced services for reporting and business intelligence. Find out how to run even most demanding SAP loads in the cloud with Miadria. Companies see 20-25% increase in productivity improvement after implementing modern productivity tools and digital processes. New technology is not only enabling new business models, it’s at a much faster rate than ever before. People and processes need to respond quickly to changes in the market. 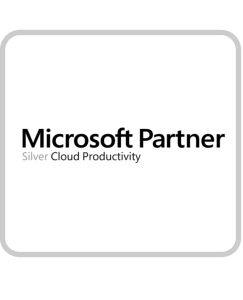 Miadria is proud to announce that we have become Microsoft​'s​ Silver Cloud Productivity ​Partner, meeting customers’ evolving needs in today’s dynamic business environment. ​Miadria's consultants are certified and well-versed in providing all aspects of project to our clients, including a top-notch support. Cloud Productivity competency assures our customers that with Miadria they receive top service for their project of moving to Microsoft Cloud. Miadria is champion of innovation and we will lay the groundwork for you to use cloud tools to mobilize workforce, create opportunities for fast and easy collaboration and open new channels for social interaction and access to resources across organization. Real time collaboration and video conferencing are just the tip of the iceberg, there is so much more. Let us know what you need and we will find the solutions that will help you in everyday work. You work in company that is matured and you operate in the traditional vertical? You think your business does not need change? Think twice. New technologies are changing the way that your competitors are doing business and Miadria might have already helped them to transform their business in a way that will increase their competitiveness day in and day out. We can help transform your company to get better positioned for the future! Simplify the way you do business. Grow your business and simplify your processes by including all your employees to digital platform so that you can concentrate on your core business and make money. Miadria has know how to provide benefits of affordable connectivity and mobile devices combined leading office productivity, networking and application solutions so that your IT staff can shift focus from infrastructure to business processes.